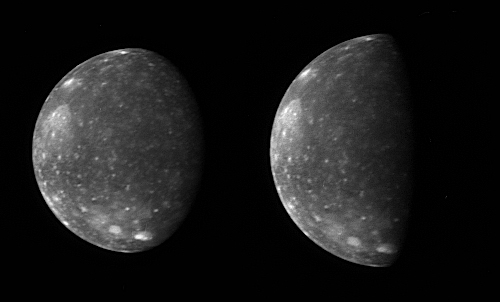 The two images show essentially the same side of Callisto - the side that faces Jupiter - under different illumination conditions. The images accompanied scans of Callisto's infrared spectrum with New Horizons' Linear Etalon Imaging Spectral Array (LEISA). The New Horizons science team designed these scans to study how the infrared spectrum of Callisto's water ice changes as lighting and viewing conditions change, and as the ice cools through Callisto's late afternoon. The infrared spectrum of water ice depends slightly on its temperature, and a goal of New Horizons when it reaches the Pluto system (in 2015) is to use the water ice features in the spectrum of Pluto's moon Charon, and perhaps on Pluto itself, to measure surface temperature. Callisto provided an ideal opportunity to test this technique on a much better-known body.